I was trying to get some photos of a big ole Red Tail Hawk today, but failed miserably. I was talking to a fishing buddy when I saw two hawks being chased by some crows. I Ran over to my truck, got my camera and started clicking away, even though they were at a distance one was headed my way. I looked over my Canon to get an eyeball view of the hawk, about that time he made a push with its massive wings and glided downward right toward me and my buddy. When I brought the camera back to my eye I could never find the huge hawk. My nerves got the best of me. 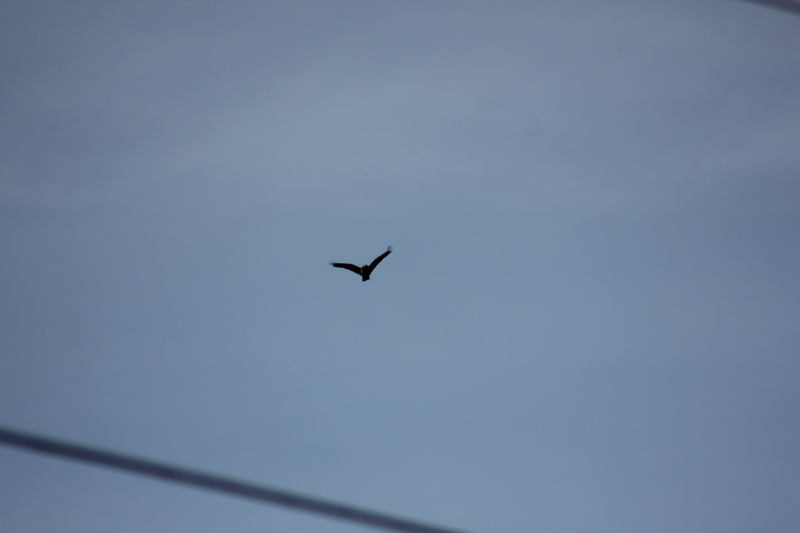 Here was this gigantic hawk swooping within fifty feet of me and I can’t get a picture. I was hollering at by buddy like a man who had sand just thrown in his eyes,”I can’t see, I can’t see.” I was a real piece of work! After the hawk flew over the pine trees and gone I was really disappointed in the fact I couldn’t stay focused enough, I lost my cool and didn’t know what to do except “I can’t see, I can’t see.” My buddy told me I had put my left eye, my non-dominate eye to the view finder, which probably kept me from getting a proper viewing angle. Sounds good anyway. Well anyway I blew a tremendous opportunity to get some good photos but I haven’t given up. Hope to learn from the mistakes I made today. I am posting my mistakes to make my successes that much more sweeter. Think I am going to read up on how to take pictures of birds in flight. Had a 70×300 lens and camera was set on the Action setting. Any ideas?